The U.S. military is considering developing a so-called “arsenal plane” to accompany stealth fighters into combat, hauling large numbers of munitions in order to significantly boost the stealthy planes’ firepower. The arsenal-plane concept, announced by Defense Secretary Ashton Carter in a Feb. 2 speech previewing the Pentagon’s 2017 budget proposal, could help solve one of the U.S. military’s most intractable military problems — its lack of “magazine depth” compared to more numerous Chinese forces in various Pacific war scenarios. But Carter didn’t specify what kinds of weapons the arsenal plane might carry and whether they might include air-to-air munitions, which is where America’s arguably greatest firepower shortfall exists. The arsenal plane, under development by the Defense Department’s new Strategic Capabilities Office, “takes one of our oldest aircraft platform and turns it into a flying launchpad for all sorts of different conventional payloads,” Carter said. “In practice, the arsenal plane will function as a very large airborne magazine, networked to fifth-generation aircraft that act as forward sensor and targeting nodes, essentially combining different systems already in our inventory to create whole new capabilities,” Carter continued. That’s because the F-22 carries just eight air-to-air missiles in its weapons bays in a stealthy configuration; the F-35 carries just two. Chinese Su-27 derivatives routinely carry 10 or more air-to-air missiles. And in a Pacific air war, the close proximity of Chinese bases to any likely battle zone means that Beijing will probably be able to keep many more warplanes in the air — potentially hundreds more. While unrealistic, that handicap didn’t actually benefit U.S. forces in the RAND war game. The F-22s and F-35s quickly ran out of missiles and fuel, and surviving Chinese fighters penetrated U.S. aerial defenses and shot down tankers, radar early-warning planes and maritime patrol planes, effectively disabling the American force by depriving it of sensor coverage and range-extending aerial refueling. 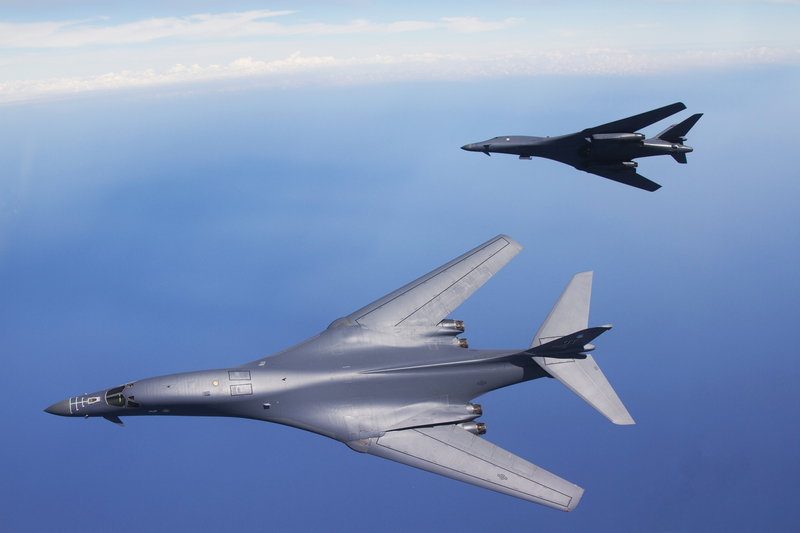 In 2011, RAND published a paper encouraging the Pentagon to consider adding 20 large air-to-air missiles to B-1 bombers. Four years later, John Stillion, a former RAND analyst and contributor to the 2008 war game and the 2011 paper, wrote a paper for the Center for Strategic and Budgetary Assessments, a Washington, D.C. think tank, proposing that the Pentagon’s next fighter should be the size of a bomber and carry 24 air-to-air missiles while also controlling drones hauling their own missiles. RAND’s paper and Stillion’s proposal were hints that the arsenal-plane concept was gaining legitimacy in military circles. But the first arsenal plane could be a fighter rather than a bomber. In 2015 Boeing unveiled a new configuration for existing F-15C fighters that doubles the F-15’s standard air-to-air loadout from eight missiles to 16. Carter’s arsenal-plane concept is consistent with years of study and technology-development pointing toward a two-tier air-combat force for the near future, one in which stealth fighters act as forward sensors, designating targets for non-stealthy aircraft — F-15s and bombers — carrying much larger payloads. To be clear, neither Carter nor Aviation Week‘s source specified whether the arsenal plane would carry air-to-air missiles. It’s possible the Pentagon is mostly interested in adding air-to-ground munitions to its stealth strike force. But technologically speaking, there’s no reason why the arsenal plane couldn’t add aerial firepower to America’s stealth fighter fleet. Right now the arsenal plane is just a concept, rather than a formal program with a budget line. But the need is obvious and the hardware already exists. With funding and official approval, in a few years’ time the F-22 and F-35 could fly into an air-to-air battle with heavily-armed bombers backing them up.